Furniture. It's necessity for any house. You need beds and dressers in the bedrooms. Couches and chairs go in the living room. The dining room should have a a table and chairs where a family can sit and enjoy a meal together. But there is one piece of furniture that you will not find in my house: a coffee table. For one, I don't even drink coffee! Wait! That's not what they're for. I know that! Silly me! Coffee tables are not for drinking coffee. They are a place to collect junk. And that is why I don't have one. I don't really need another place to collect junk. As a matter of fact, every single flat surface in my house is a place to collect junk! The mantle over the fireplace? It displays a nice mirror, some candles, my diffuser, and a few toys that are in time out. The side of the tub? That's where we store shampoo and shave gel. And empty bottles that I keep forgetting to recycle. The TV trays in the living room? Those collect mail, my keys and phone, and various other odds and ends unless I fold them down and put them out of the way. I swear, every flat surface in my house becomes overrun with stuff! Even the places you wouldn't necessarily expect. The 2 inch wide flat piece at the top of our bed frame? It holds a box of tissues and a water bottle. I used to put my glasses there after reading in bed at night until I knocked them off once and scratched the lenses. The top of the entertainment center? There's a poster and a kids' toy up there. I don't even remember how or why they got there! I just know it's been a while. We have a heater in the bathroom. The top of it is maybe a 6 inch diameter oval. It accumulates earrings, necklaces, and hair ties until I need them again or remember to put them away. It's a serious issue with me. I'm working on it and trying to train myself to put things where they belong, but it's a slow, slow process. So even though my first thought was to name laundry as my nemesis, after some serious thought and a quick stroll around my house. It has become all too obvious that my real nemesis is: FLAT SURFACES!!! ...and cute kids. They are my other weakness. I'm linking up for #MommyReality with JENerallyinformed.com and LeapfrogsandLipgloss.com. Mom's might not all be super heroes, but you can bet we've each got a nemesis! Yes, all the fat surfaces here, too become overrun with all sorts of stuff, as well!! So true!! Flat surfaces are a very dangerous nemesis! A flat surface is just a space waiting to collect junk that destroys our efforts to stay tidy and neat. My husband hates coffee tables for that exact reason and has kindly asked that we don't have one. Pus coffee tables seem to be a head injury magnet for toddlers and in kids in general. It always seems like when we visit somewhere with a a coffee table, BAM one of my kids hits their head on it! Oh so true!!! Stuff, stuff everywhere! Flat surfaces.. I can't even handle them. If it's not me, it's the cute kids putting everything they own on them. Everything!! Oh I have too many of these areas lately! LOL! My dresser shares space with the TV and my computer desk is a catch-all for EVERYTHING! Oh my gosh, you have opened my eyes! It is so true, I just pile stuff wherever there isn't already other stuff! I've actually gotten better about this since moving to a new place. Now I'll for sure be keeping it in mind - the first step is awareness! I'm very particular with what I put where. LOL. 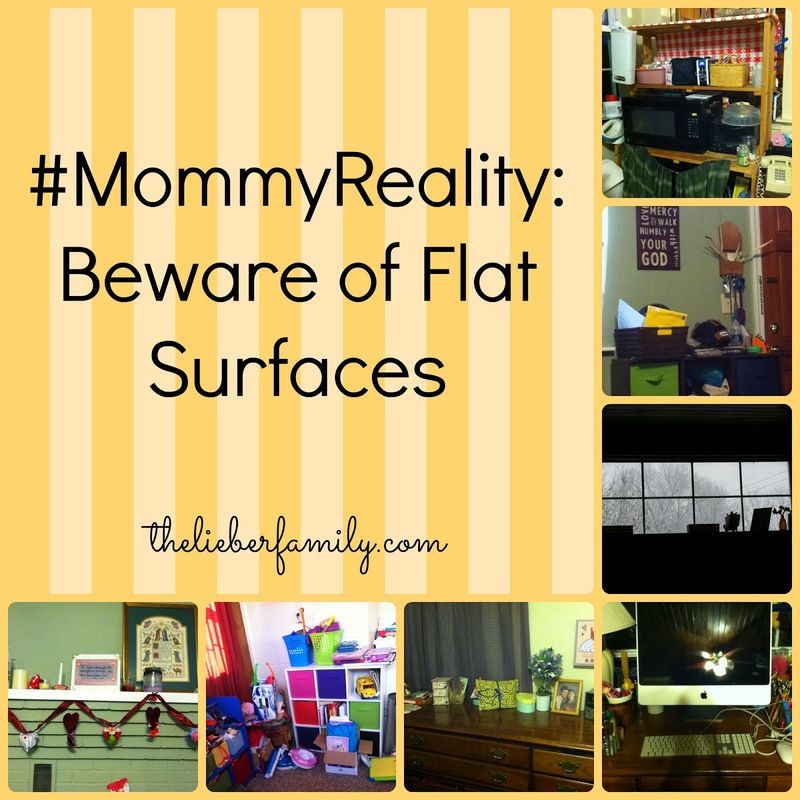 I actually love flat surfaces but it's true that they can get cluttered quickly especially with my boys in the house. Oh man... this is the truth! Flat surfaces are terrible! Oh, and another thing. That one chair. Everybody has one, I think. That just keeps getting more and more piled onto it. I didn't even think of this...but you're SO right! I'm always battling with my family to keep the island clear. Most days I only get half of the island (my only prep space) to make dinner. And don't even get me started on the Husband's office. Ugh. Good luck finding a new flat surface! Hi Rabia, I so loved reading your post, I actually got neck ache nodding. We have junk everywhere too and not only on flat surfaces. If it makes you feel a little better; sitting here I can see two radiators, that have been made obsolete since getting a wood burner, that have bits of paper, the dogs food bowls, two halves of a rolling pin (don't ask) and a muscle roller on top of them. And on the wire rack (that is meant for damp washing) hang two folded down snooker cues a bandana (that finished drying about two years ago) and a water bottle holder! I am pleased to see we are not alone! My 5 YO son was trying to pour some cereal over the weekend and he freaked out because he couldn't find anywhere to put his bowl! The fact that he's short and can barely see the counter made it that much more funny! *that chair* is the one my husband likes to sit in. He's alaays complaining about all the junk in it, but it's usually his junk, so I ignore him! I'm afraid to watch that show! I think I might be on an episode or three! See, I'm not too particular which is how the problem started! I keep thinking it will be better when we get a bigger place, but I'm secretly afraid that I'll just have more places to pile stuff then! We can usually only sit on one half of the couch. There's clean laundry on the other half 95% of the time! Darn those cute kids!! LOL!! All over my house! I'm hoping to get a bunch cleaned out of the basement this summer, though! Lessening the chance of head injuries was just a side benefit of ditching the coffee table. My boys have found plenty of other ways to injure themselves though! Even the top of the entertainment center? That one baffles me! I can't reach to clean it off, though! Wow! You have reminded me of another Nemesis. After doing this challenge, I am overwhelmed by the number of evil giants in my life!